The sunlit garden party group. 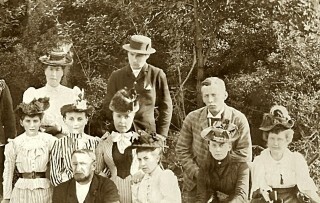 Believed to be Daniel Richmond Daybell left of centre. 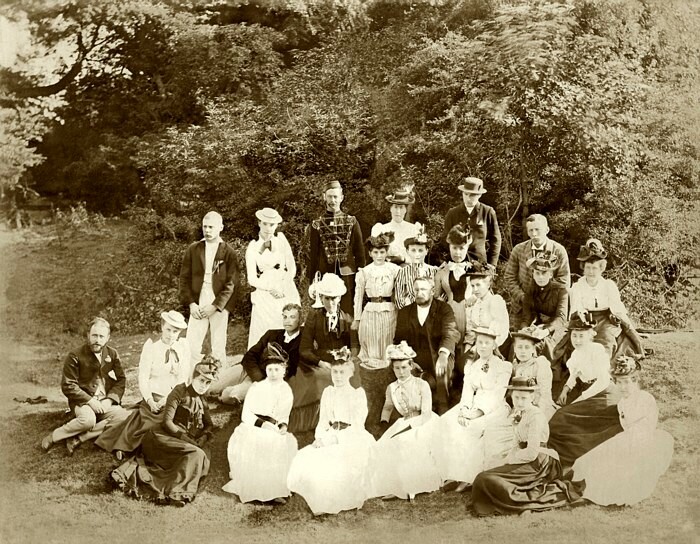 These pictures show an old photograph, belonging to Mary Owen (nee Topps), of an elegant garden party. The photograph had been mounted on stiff cloth and covered with a sheet of bevelled glass to which it had been, or had become, bonded. Tragically at some time in the past the glass had been fractured, and the picture was in a delicate damaged condition. Removing it from the broken cover glass was not possible, but restoration to something close to the original image has been achieved by the expert attention of Sheila Marriott, using digital wizardry to remove the cracks and put the damaged features back together. This was painstaking work, and we are indebted to Sheila for her support. 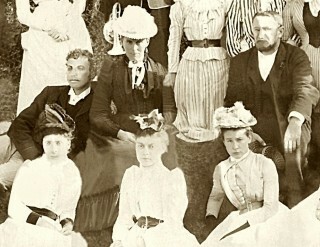 Mary believes that the gentleman lounging in the centre of the group, with curly hair, is her late grandfather, Daniel Richmond Daybell. He was born in 1869 and married in 1905 after leaving Bottesford. She thinks that her grandmother is not in the picture, and that it is most likely that the picture is Victorian rather than Edwardian. 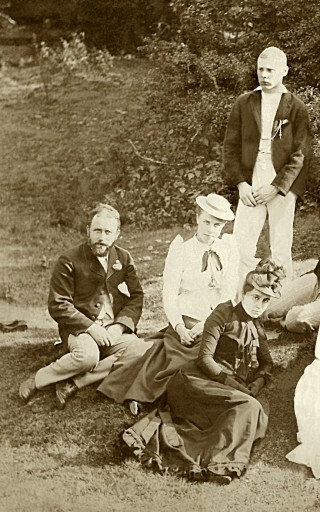 Who are the other people in the picture, and where was it taken (and when)? 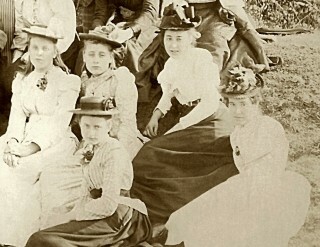 Mary and husband Malcolm are not certain of any of the other people, but think it likely that the Misses Beatrice and Nellie James are among the “girls”. 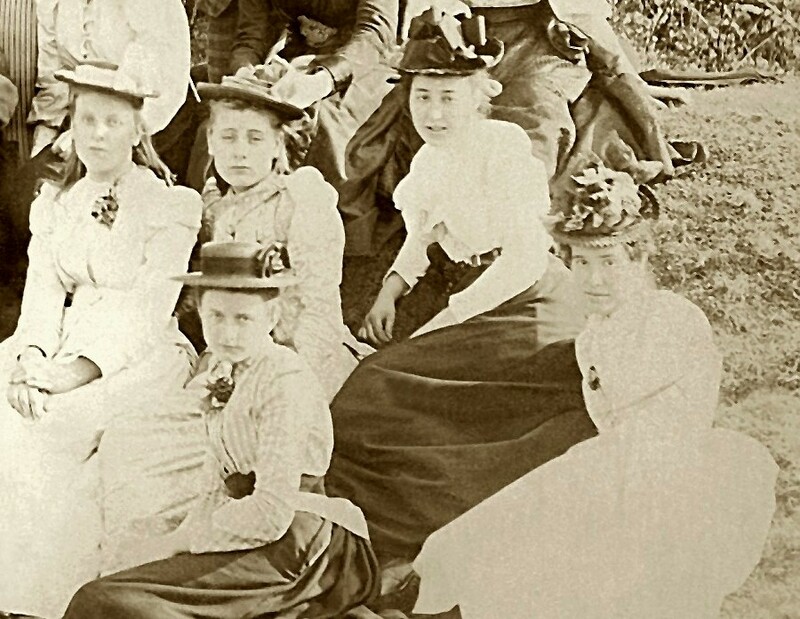 These sisters lived in No.6 Church Street, and were well known as teachers of music and dance. Another is probably their cousin Miss Edith James who owned the terraced house in Chapel Street next to Fleming’s Hospital. Apparently all the Miss Jameses died in the 1950s. We would be grateful for any identifications and background information. 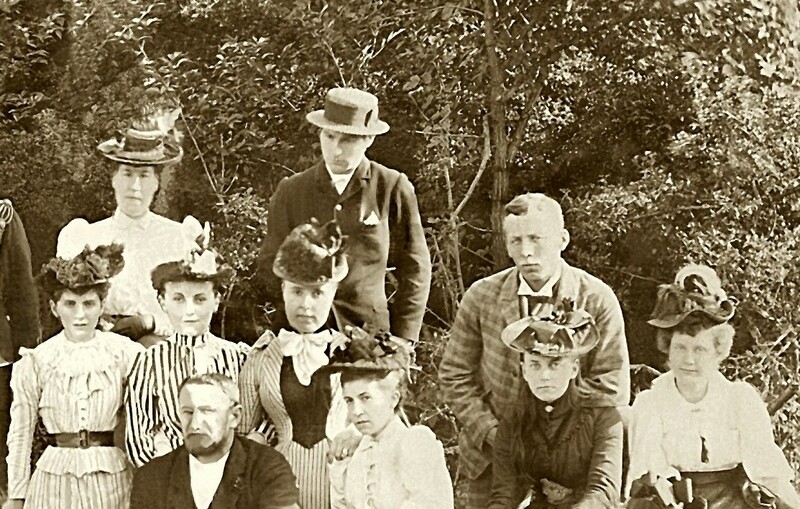 The man in uniform at the back, proudly showing off his finery, is possibly from the Belvoir Militia. Their uniforms were heavily braided. He is carrying a cornet, suggesting that he may have been a bandsman. The James family were well established in Bottesford and Easthorpe. Deeds from No.10 Manor Road, Easthorpe, kindly lent to us by Mrs Christine Coot, show that this house was bought by Miss Eleanor James in the ‘Duke’s Sale’ of 1920. She died in 1943 while living at No.3, Wyggeston Terrace. Deeds kindly lent us by Mr Lol Pickin show that a Mr Edward James purchased Nook Farm during the 1920 sale. 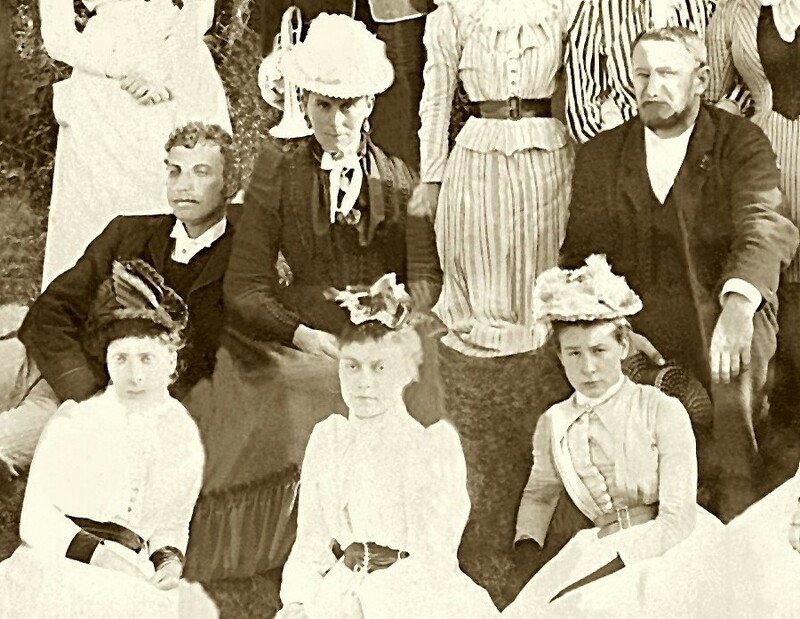 It is tempting to expect that all these people were related, but we have nothing to prove this was so. Sheila Marriott is well known locally for the wonderful Barkestone le Vale local history project. 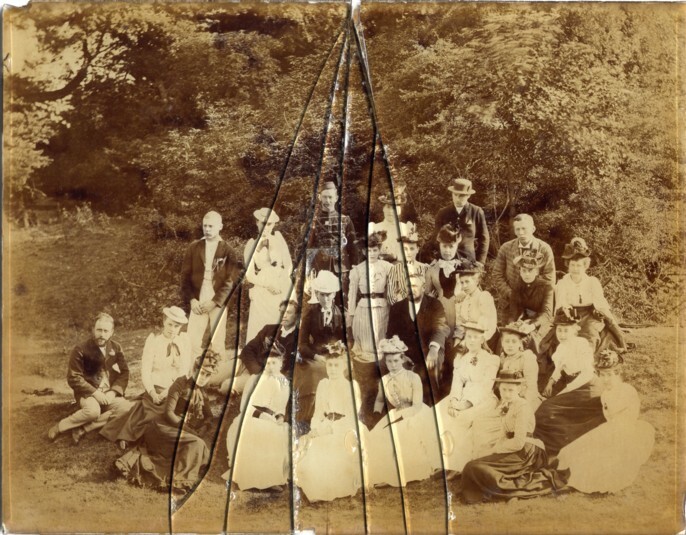 In addition to bringing together the Barkestone project’s great collection of photographs, maps and the village’s ‘family tree’, Sheila is a genealogist and digital picture restorer. If you haven’t visited its annual autumn exhibition in Barkestone then you have really missed something. I am really interested in the gentleman wearing the military uniform. I e-mailed your good self some some months back asking about my great grandfather, John Thomas Cooper who was buried at St Mary’s, Bottesford on 2/7/1904, aged 46. He was given a military funeral because he had been a member of the Belvoir Volunteers for some 20 years, and had been their company bugler, rising to the rank of Lance-Sargeant. It is a long-shot, but is it possible that the uniform belongs to the volunteers and it is him in the photograph. He also trained boys in the bugle band, which may have been connected to the volunteers. It is also of interest that John Thomas and his family including my grand mother were living at No6 Queen St during the 1901 census. It is a great site, keep up the good work. I am also really looking forward to our visit to Bottesford later this year. 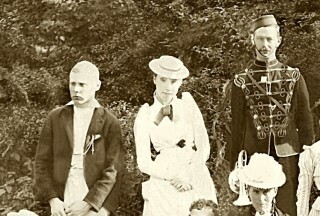 Thank you Don for this interesting observation as to the possible identity of the uniformed person in the photograph . There was a mention of the Belvoir Volunteers in the Grantham Journal recently. * Members of the Belvoir Volunteers (K Company 1st Volunteer Battalion Leicestershire Regiment) held their annual dinner at the Peacock Hotel, Belvoir. Thanks for these pieces of information. ‘Keep em coming’ as they say. I suspect that another of the people on the picture will turn out to be the headmaster, G.V. Collett (known as “Boss” Collett). I have been meaning to pull together information about the Cooper family, but have been waiting to see if I can meet any of their decendents in the present day village (not successful as yet). There is quite a lot in the censuses, which take us up to 1901 just a few years before John Thomas Cooper’s death. There’s a lot more I could add, once I have gone back over the information to check it out. In regards to the name Cooper, my next door neighbour when I lived in The Police Station in Queen St The last of three houses Cooper, Bend, Wing.not sure of the number but there was a mention in the article of No 6 that was dated in the 1901 census . If your remember we were at the Police Station from 1948 to 1953. And their daughter Maureen was at Bottesford C of E at the same time as me. There was also a brother Albert Cooper who lived directly across from the Red Lion and he was like me a Painter and Decorator and worked for W. J. Roberts.